Introduction Achilles tendinopathy is a common problem among athletes (Jarvinen, Kannus et al. 2005). Various risk factors exist and poor endurance is likely to be one of these (Silbernagel, Gustavsson et al. 2006, Malliaras, Barton et al. 2013). Eccentric training is an effective treatment for Achilles tendinopathy(Alfredson, Pietila et al. 1998). This study was designed to investigate the potential effect of eccentric training on endurance of the triceps surae muscles to indicate whether endurance could be improved in healthy individuals and to establish whether eccentrics may have a potential role within primary prevention of Achilles tendinopathy. The reliability of endurance measured using isokinetic dynamometry was assessed. Methods 37 volunteers (29 males, 8 females) took part in the reliability study and 32 volunteers (24 males, 8 females) in the effect of eccentrics on endurance study. Subjects were tested using the Cybex Humac Norm© isokinetic dynamometer under controlled conditions, on two occasions (2–7 days apart). The endurance test on both legs was 20 repetitions long, at a velocity of 90°S-1, in both eccentric and concentric movements in bent knee (90°) and straight leg positions. 32 subjects were re-tested after 12 weeks of eccentric training on one leg (with the other leg used as a control). Results Results showed that Total Work Done was a reliable measure of endurance (ICC range 0.75–0.91) but that Fatigue Index and Endurance Ratio were not (ICC range -0.44–0.67). 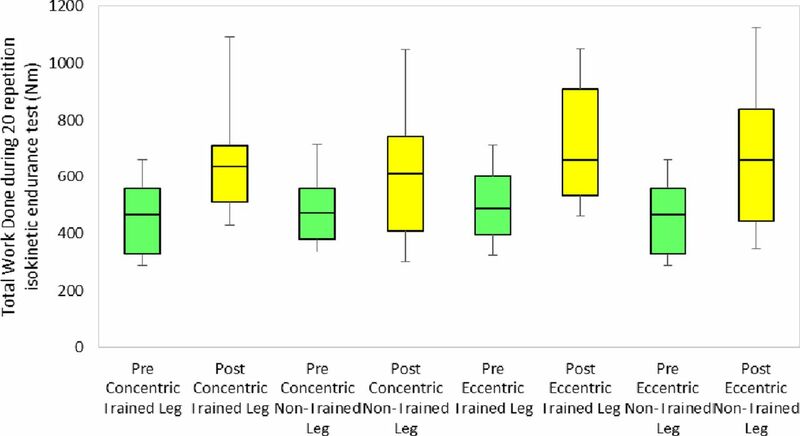 Significant improvements in bent knee (see figure 1) and straight leg positions in concentric; trained and non-trained legs and in eccentric; trained leg only were observed in the low baseline endurance group. Only concentric; trained leg in the bent knee position significantly improved in the high baseline endurance group suggesting that eccentric training has the capacity to improve endurance in those with underlying deficits. Discussion This study has identified a reliable isokinetic measure for endurance of the calf muscles and a method for improving calf muscle endurance. Investigation of the potential application of eccentric training as prevention of Achilles tendinopathy requires further research.